Returning from a sabbatical in 2007, I vividly remember driving down 31st Street after having been away for many months. As I passed under the Metra tracks, I glanced to my right to see Mies Campus and suddenly realized that I was home. Illinois Tech was my home. I’ve never forgotten that moment. Since then I’ve often thought about what makes Illinois Tech special, what makes it better than other schools, what makes it home. I’ve concluded that the answer is actually quite simple. It’s the people—the students, the faculty, and the staff. Our student body is truly diverse, with students attending today from 100 countries. Our alumni include the first-known African-American chemical engineer, Charles Pierce (CHE 1901); the inventor of the cell phone, Martin “Marty” Cooper (EE ’50, M.S. ’57); and even a former president of Lithuania, Valdas Adamkus (CE '61, Hon. Ph.D. '99). More recently our students and alumni were instrumental in creating a billion-dollar company (Cleversafe), according to that company’s founder, Illinois Tech Trustee Chris Gladwin. In this issue of IIT Magazine, you can read about our alumni today who are making strides in their chosen fields of research, from Carly Coulson (ARCH ’97), who is exploring “Invisible Sustainability” in building design, to John Brophy (ME ’78), an interstellar engineer with NASA’s Jet Propulsion Laboratory. Staff members across campus distinguish themselves through their dedication to both students and faculty. They serve as mentors, role models, and coaches. They volunteer to serve on the Student Success Committee, they stay late and show up early. Without them, the university could not function. I hold a particular affinity for my fellow faculty who through the years have built the first private nuclear reactor, developed magnetic recording technologies, established the New Bauhaus, and pioneered modern architecture. Colleagues include Nobel laureate Leon Lederman and world-renowned architect John Ronan. Faculty also maintain the rigorous academic programs that have served our graduates well. Our return on investment is one of the best in the country! Our faculty are the cornerstone of our research efforts and inspire the next generation of innovators pushing the boundaries of exploration and discovery. The one common denominator I’ve found is that Illinois Tech-ers sincerely and modestly do their best to build an institution that is stronger and better than when they arrived. They support one another unlike anywhere else I’ve been; I’ll be forever grateful to those who have unselfishly assisted me over the years. Our students, faculty, and staff are why Illinois Tech is my home. 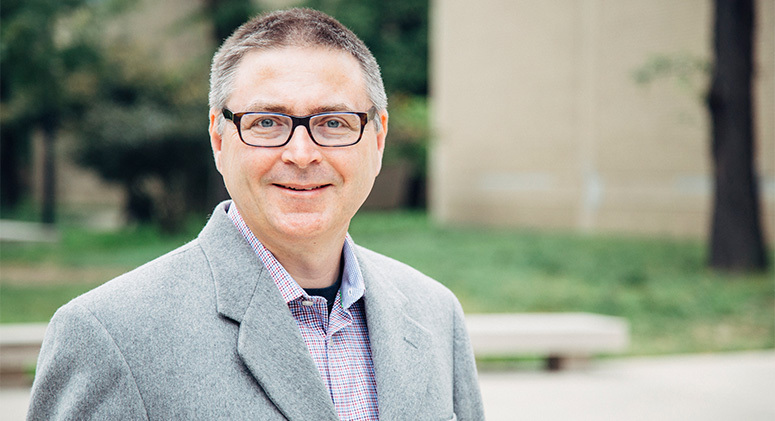 Christopher White came to Illinois Tech in 1995 as a particle physics researcher and was named a tenure-track faculty member in the College of Science in 2000. A professor of physics, he has performed high-profile research with colleagues around the world on the Daya Bay Reactor Neutrino Experiment Collaboration. In 2016 White and other members of the Daya Bay team received the Fundamental Physics Breakthrough Prize for their discoveries. The recipient of several teaching, research, and scholarship awards, White served as chair of the Department of Physics from 2011 to 2013 and was then promoted to vice provost.